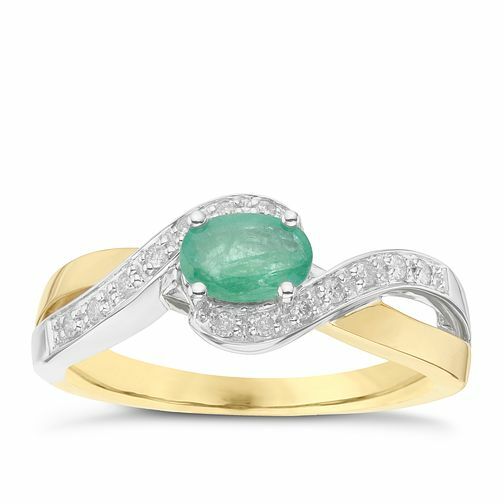 Showcasing a stunning emerald stone centrepiece, this chic 9ct white and yellow gold ring is styled with alluring flowing lines. Delicate diamonds add a luxurious finishing touch to this creatively crafted piece. 9ct Yellow & White Gold Diamond & Emerald Ring is rated 4.0 out of 5 by 1. Rated 4 out of 5 by Anonymous from Value Ring Pretty diamonds with a discernible sparkle, arranged in an attractive cross over, with deep green central emerald. Quite timeless, modern without being outlandish. Good for any age 18-80+.